This ball is COOL! All you do is throw it into your washer and BAM...clean clothes. I admit opening up the tray and poring in liquid detergent isn't the biggest task in the world, but just throwing in a ball has spoiled me rotten!! The Robby Wash Ball will last for 12 months on average or over 120 washes!! The ball itself will last for 2 -3 years. I tried out the Robby Wash Fuchsia Landry Ball Pack from the green home products company Oransi. The Fuchsia one is for cold water loads and there is a Blue Washing Ball that is for loads using temperatures above 90F. The pack comes with the washing ball, a stain stick and 3 extra packets of pellets! 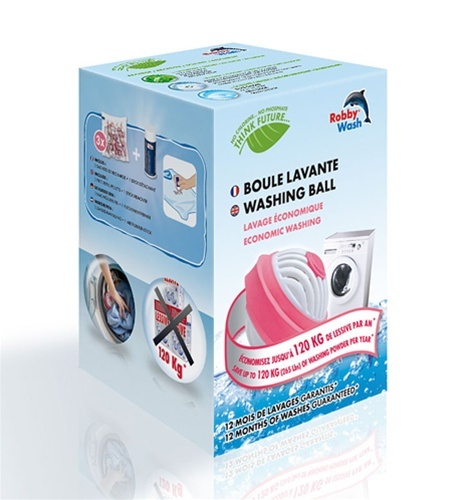 The Robby Wash ball uses a unique and patented worldwide technology to clean your laundry even better than the powder laundry detergents it was independently tested against. Its activated macromolecules are gradually released through the wash, dissolving dried-in stains by generating ions which activate the water molecules. This increase in the pH enables the activated molecules to penetrate deep into the fabrics and attach themselves to the stains. As the motion of the drum agitates the clothes, the stains come away easily from the fabric and dissolve in the water. Of all the systems on the market, Robby Wash's effectiveness is tested, proven and guaranteed. The ball also guards against oxidation and discoloration caused by chlorine in the water. It also eliminates odors. I highly recommend the Robby Wash Ball! I've recently used Purex, Kirkland Brand, Tropical Traditions, and Tide. I receive the same quality and NO mess. :):) The two rules you need to remember when using the ball is that the load and the ball need to be full to work effectively. OH and oversized machines will require 2 balls. See more details here. You can get a Robby Wash Fuchsia Laundry Ball Pack for $32.95 with FREE shipping! Since the majority of our laundry is done with cold water this ball is a HUGE money saver for us! I used to easily spend twice that in a year!! When I buy the Blue washing ball it will be a LONG time before I have to buy laundry detergent!! Oransi has some other great eco-friendly products. Keep in touch with Oransi on Facebook and Twitter to find out about sales and more giveaways! 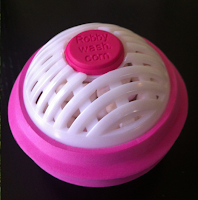 One reader will win their choice of a Fuchsia or Blue Robby Wash Laundry Ball Pack! US only, No PO Boxes. Entries will be verified. a Rafflecopter giveaway Giveaway will end August 1st at 11:59 pm. Sponsored by Oransi. I received a product for review. No other compensation was received. All opinions are my own. This promotion is in no way sponsored, endorsed or administered by, or associated with, Facebook. We hereby release Facebook of any liability. Winner will be contacted by email and will have 48 hours after the giveaway ends to respond before another winner is picked. The ionic fridge air purifier looks cool. I would love to try this laundry ball! I would love to try the air purifier! their uv air purifiers look interesting! I would like to try any of the air filters. like many others here, i would love to try the air purifier. I have had severe asthma since i was born and would love to have something to help more. An air purifier would be nice. We live in an old house and i've got old house allergies! i would really like to try the ionic fridge deodorizer. better than baking soda, i'd say! I'd love to try the fridge air purifier as well! I'd like to try the Ionic Fridge Air Purifier. It looks easy enough for my six-year-old to do laundry. I forgot to say we would need the refrigerator deodorizer. I really want the Oransi Fridge Air Purifier! I want to try the fridge purifier! I would love to try their air purifier! I am a big fan of natural cleaning, so I'd love to be able to try out the laundry ball. Right now I am making my own powdered detergent. I would like to try in of the air purifers. I'd like to try any of the air purifiers. The Oransi fridge air purifier looks really neat. I have never heard of something like this what a great idea. Time saver is always my kida thing. I like the finn uv air purifier!!!! I would like to try the Ionic Fridge Air Purifier next. :-) Thank you. The Finn UV Air Purifier! Next I'd like to try the Ionic Fridge Air Purifier! 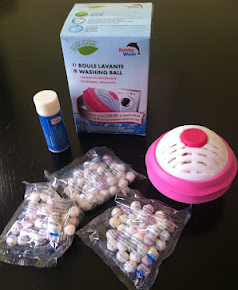 I got asked to review the fridge purifier, but the air purifier or these laundry balls really look awesome! Hepa Max Air Purifiier, my son has asthma, that would be amazing! I would love the Ionic Fridge Air Purifier. I bet that would be an awesome product. Finn UV purifier for my bedroom.. I would like to try one of the Air purifiers!! i'd love to try the Ionic Fridge Air purifier. I'd like to try the Finn air purifier. The uv air purifiers look awesome. The air purifiers look great, as all the posts show, but I'd certainly be really glad to try either of the wash balls. Sensitive skin, plus a hubby whose workout clothes can get (phew!) really stink, I'd love a cleaner that would effectively tackle both problems!